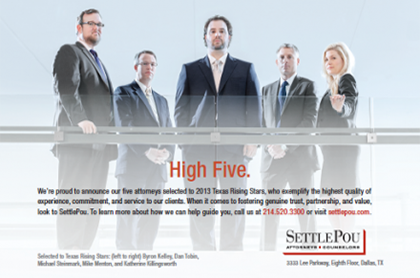 SettlePou is proud to announce the naming of five of our lawyers in 2013 Texas Super Lawyers, Rising Stars Edition: Katherine L. Killingsworth, Michael R. Steinmark, Daniel P. Tobin, Michael P. Menton, and Byron L. Kelley. Michael Menton and Byron Kelley earned their first selections to the annual list, with Katherine Killingsworth and Dan Tobin earning their second, and Michael Steinmark his third. Texas Super Lawyers, Rising Stars Edition is described by the publisher as a listing of “the best attorneys who are 40 or under, or who have been practicing for 10 years or less.” Selection is limited to only 2.5 percent of all lawyers in Texas. The publication is available online at www.superlawyers.com/texas, which also features individual attorney profiles.